(RNS) On Friday (Sept. 25), I sat onstage with Pope Francis at a multifaith service at the 9/11 Memorial Museum in New York City. I was invited to offer a prayer from the Sikh scripture, with my daughter, Dr. Gunisha Kaur, who provided an English translation. The occasion led me to reflect on my near-death experience over 30 years ago. In 1984, I was returning from Hyderabad, India, in the south to my home in Amritsar, Punjab, in the north. When we neared Delhi, a mob of vigilantes stormed onto our train and called for the blood of each and every Sikh. The mob beat me nearly to death. The vigilantes must have thought they had killed me, because when I lost consciousness they threw me off the train and onto the tracks. I was left for dead. After I came back to consciousness, I realized that another attack was imminent. I believed in that moment that I would never see my family again. I closed my eyes and said goodbye to my wife and children. I prayed for the souls of everyone I knew, including my attackers. The mob was part of a larger pattern of violence that targeted thousands of Sikhs all over India. Two Sikhs had assassinated Prime Minister Indira Gandhi, and the mob sought revenge by attacking innocent Sikh civilians — as if it were justified to hold an entire community responsible for the actions of a few. When I finally reached my family in Amritsar, we made the painfully hard choice to move to the United States, where I am now working as a professor of pharmacology. The culture of the U.S. cohered better with my own ideals of justice and religious freedom, and I came to appreciate the value of community-building. Reflecting on how I barely survived the intense violence produced by religious animosity, I decided to devote myself to making our world a better place. 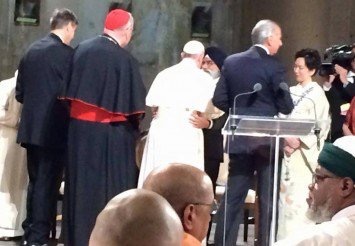 I drew from my Sikh outlook and started to build relationships across religious boundaries. It is from this lens that I have come to deeply appreciate the leadership of Pope Francis. He embodies the Sikh concept of servant-leadership, which suggests that the best leaders are those who are constantly looking to serve those around them. Francis’ decision to drive around in a humble Fiat reflects his humility. His act of dining with the impoverished rather than with political leaders illustrates his humanity. And his willingness to speak openly about pivotal social issues shows his commitment to righteousness. I admire these features in Francis, because each of them represents what my Sikh faith teaches me about living a good life. Many of the values he espouses are the same values to which I aspire as a Sikh. My Sikh faith teaches me to identify with and serve the most needy among us. In our tradition, service is a way of praying through action and of expressing our gratitude to the Creator for all we have been given. This is an outlook that I see reflected consistently in Francis’ actions. As a Sikh, I also believe I have a responsibility to stand for justice, even when it is difficult to do so. Francis has shown leadership in this regard as well. In his brief trip to the U.S., he has already weighed in on key issues of our times, including immigration and poverty. I am thankful to Francis for taking such stands and support his sentiments on these issues. As I sat next to Francis during the ceremony at the 9/11 memorial, I kept thinking to myself: “Never in my life could I have imagined I would be in this position.” I am honored to have been selected to share the stage with this great man. Although we do not share the same religious tradition, we both share a view on what it means to be a person of faith.